The answer to this GMAT question was not what I expected it to be. Link to the forum page here. Up until now, I was certain about two fundamental truths about grammar. It is always possible to connect an independent clause to another independent clause by using an appropriate coordinating conjunction and adding a comma. A list of two items should not have a comma between the two items unless absolutely necessary to avoid confusion. Now that I have seen this question, I am stumped. I thought the correct answer was A, but it turns out that the official answer was E. I believe A is correct and E is incorrect. The reasons cited for A being incorrect and E being correct are the same: parallelism. A does not maintain parallelism between "listening" and "he prayed", while E maintains parallelism between "listening" and "praying". Given that this question and the official answer were supplied by an official GMAT test organization, I am inclined to believe this. But I do not find this explanation satisfactory. It is to my understanding that you can always combine two independent clauses by using an appropriate coordinating conjunction and adding a comma. She waved goodbye. He waved back. We are free to combine the sentences like this. She waved goodbye, and he waved back. The dying old priest lay in his bed, listening to his disciples recite sermons he wrote years earlier. He prayed for salvation. Here we have two independent clauses. 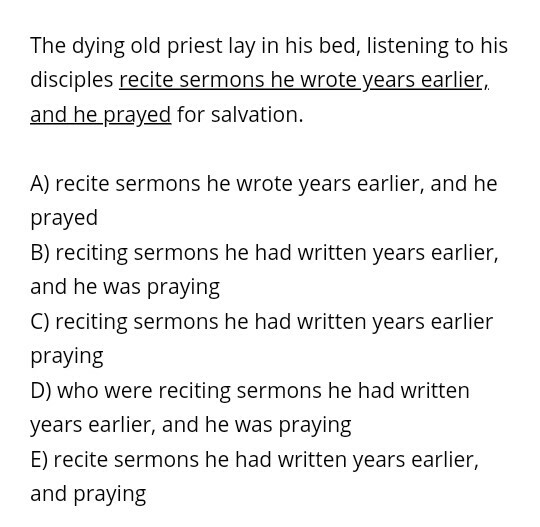 The first independent clause ("The dying old priest lay in his bed, listening to his disciples recite sermons he wrote years earlier") uses a sentence structure that I have seen many times before where a present tense verb is used even while the main verb is in past tense to indicate that the two are happening at the same time. (For example, "He walked to the park, whistling all along the way.") For this reason, I do not doubt that it is a grammatically correct independent clause. I know the second sentence is a grammatically correct independent clause for obvious reasons. Given that the two are independent clauses, and that the conjunction "and" is appropriate, we can combine them using the conjunction and a comma. Right? The dying old priest lay in his bed, listening to his disciples recite sermons he wrote years earlier, and he prayed for salvation. This gives us option A, which is apparently incorrect. But I do not understand why. The explanation cited for why answer A is incorrect is because of parallelism, but to my knowledge, parallelism does not apply here. We are only combining sentences using the most fundamental method of combining sentences: a coordinating conjunction and a comma. Parallelism is (again, to my knowledge) only applicable when you are creating a list. We would only be creating a list if there was not a comma before the "and". The dying old priest lay in his bed, listening to his disciples recite sermons he wrote years earlier and he prayed for salvation. If we remove the comma, we are creating a list and thus have to maintain parallelism. The dying old priest lay in his bed, listening to his disciples recite sermons he wrote years earlier and praying for salvation. This ALMOST gives us answer E, but in answer E there is an extra comma. The dying old priest lay in his bed, listening to his disciples recite sermons he wrote years earlier, and praying for salvation. I believe this sentence is already obviously incorrect, but it will be more clear if we shorten it a little (but still keep the list of two items). The dying old priest lay in his bed, listening to his disciples, and praying for salvation. The girls were skipping, and hopping. I went to the store and got milk, and eggs. 1) Does parallelism need to be followed if you are not creating a list and are only combining two independent clauses with a conjunction and a comma? 3) Is my fundamental truth of "It is always possible to connect an independent clause to another independent clause by using an appropriate coordinating conjunction and adding a comma" correct? 4) Is my fundamental truth of "A list of two items should not have a comma between the two items unless absolutely necessary to avoid confusion" correct? This is a classic "best answer" dilemma. I agree with you that A is the best answer (and that "parallelism" is not relevant to whether A is correct). But you are dealing with the GMAT here and, as I learned from my favorite law professor, you need "to make a test of it." In other words, you need to consider not only which answer you prefer, but also what the question is designed to test. Parallel structure is one of the basic ideas that you should be looking for on the GMAT. They just want you to match up "listening" and "praying." Simple as that. With respect to the comma in answer E, I also agree that the two parallel subordinate clauses are clearer without the comma. However, given the length of the clauses, a "rhetorical comma"--a comma used to denote a pause--is not out of the question. “A” is not ungrammatical, but presumably the test authors don’t like it because it uses “wrote” instead of “had written”. From a descriptive standpoint, it’s hard to say that the past perfect is obligatory in this kind of context, but a common prescriptivist idea is that the past perfect “should” be used in sentences like this. E is definitely the write answer. 1) I know little about parallelism, but as I understand it, it means that the verb tenses have to accord. The "independent" clauses you want to connect still have to be matching verb tenses. 2) I believe this assumption is incorrect, the absence of the comma actually makes the lack of parallelism strike me more than it did with the comma present. 3) & 4) I don't understand how these questions are related to the prompt, and even if I could understand that, I wouldn't be able to answer them. You might be right about someone who walked to the park whistling, but those two things happened simultaneously. The writing of the sermons happened long ago, so it is incorrect. Because the priest's actions are in the present, but there is also the past action of having written the sermons, there needs to be the "had written" portion, to preserve the parallelism. Well you are obviously very educated, but I would have answered E on this exam and here is why. I was taught that you should always be able remove everything between two commas and the sentence should still be grammatically correct. So if we do this with A through E, E renders out, "The dying old priest lay in his bed and praying for salvation. A - D are clearly incorrect. Hope this helps. Not the answer you're looking for? Browse other questions tagged grammar grammaticality commas sentence conjunctions or ask your own question.